Andreu Cottage is a charming and cosy cottage securely hidden in a quiet corner of Callander with spectacular views to Ben Ledi. It has 2 bedrooms and sleeps 4 people. The Cottage is an excellent base for exploring historic Scotland and is superbly situated for outdoor activities including walks, cycling, climbing and canoeing. It is also extremely easy to reach, being around one hour’s drive from Edinburgh and Glasgow, only 20 minutes from the M9 and is only a few minutes’ walk from the centre of Callander and all its amenities. The solid stone walls and traditional design give an attractive, cosy and secluded atmosphere. The ground floor accommodation comprises, a large, well equipped, dining/kitchen area, a double bedroom, utility room, and entrance vestibule. Stairs lead to the first floor accommodation, which comprises a bright living room, and well appointed, twin bedroom with ‘en-suite’ bathroom. Both upstairs rooms have a spectacular outlook, over the rooftops of Callendar, towards the majestic slopes of Ben Ledi. The main bathroom is located on the ‘half-landing’. All windows are double glazed and there is gas central heating throughout. To the front of the cottage is a small, enclosed, peaceful garden. 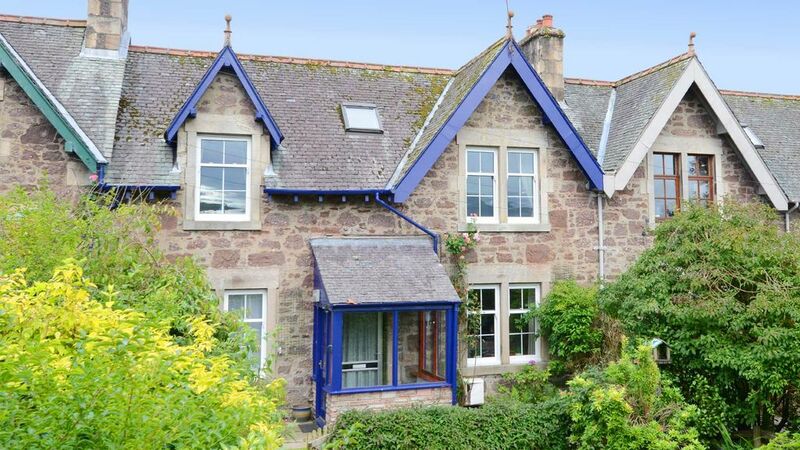 Perfekt and lovely stone teracced house in a quiet byroad of Callander. It has not big but full equiped kitchen, comfortable bedrooms and a nice living room on upstairs. Callander is a great base to explore Scotland with car from Edinburgh to Loch Ness. Charming property in lovely village. We stayed in Andreu Cottage, Callander for a week in May with our young son (2). The property itself is very well made out and contained everything we needed for our stay. I thought, after visiting, that the pictures don't do justice to the property which is very quaint and decorated in a mix of modern and traditional style. All facilities in the cottage were working and we had no reason to complain about anything relating to the property throughout our stay. The weather during our stay was very good which allowed us to make good use of the private garden. Unfortunately we didn't notice the BBQ and charcoal until our final day otherwise we would have made good use of those too. The views from the living room over the Trossachs National Park are quite amazing and only a snapshot of the breathtaking area which is the main draw to this property. This was our first visit to the national park and we will definitely be back. Callander itself is a very nice village with loads of local, independent shops and everything you could need during your stay. The cottage is ideally located to visit attractions and amenities. We were busy every day and we could have stayed another two weeks and still not visited all of the places we wanted to. We usually visit the Lake District but will be visiting Loch Lomond and The Trossachs from now on and this cottage is an ideal base for anyone visiting. The one concern we had before visiting was that there is no private parking at the cottage. We needn't have worried, however, as there is plenty of parking within only a few metres (20 metres) of the garden gate and we were able to park at the gate whilst loading and unloading the car on arrival, departure and, when needed on a daily basis. Many thanks for your wonderful review, we are always happy to recieve feedback, especially positive, are happy you had a nice holiday and would be happy to welcome you back at any time!! Would definitely stay here again in the future. Maison de caractère, très bien équipée. Sous un aspect retro cette charmante maison est très bien équipée. Elle est également très bien située dans la ville de Callander qui est un endroit très agréable. La ville, au sud du parc national, est idéale pour des départs de randonnées d'autant plus que les parcours sont bien balisés. Le confort de la maison procure un espace de repos appréciable après avoir marché. De plus nous avons eu la chance avec la météo, du soleil et de la chaleur pendant notre semaine. Many thanks Christine and Philippe for your custom and nice words about our cottage. We would be happy to have you return at any time in the future! Rental period During the main holiday season, from Easter to the end of October, Andreu Cottage is rented per week, from Saturday to Saturday. During the off season, Andreu Cottage is in addition to full week rents also available for short breaks down to a minimum of 3 nights. Terms and Conditions Group size is limited to a maximum of four persons (adults and children) plus one baby. Free car parking available on quiet street approximately 60 metres from cottage. Your car may be temporary parked approximately 10 metres from cottage for unloading/ loading. Bed linen, towels, heating and electricity are included in the price. Check in is from 4pm on arrival day. Check out is by 10am on departure day. Pets are not allowed. Smoking is not permitted anywhere within Andreu Cottage. Andreu Cottage is rented for private holiday purposes only and shall not be sub-let. The tenant will be responsible for the repair or replacement of any breakages, loss or damage and shall leave the property in a clean, neat and tidy condition.